The Cloudace from ON is the ace up your runner’s sleeve. 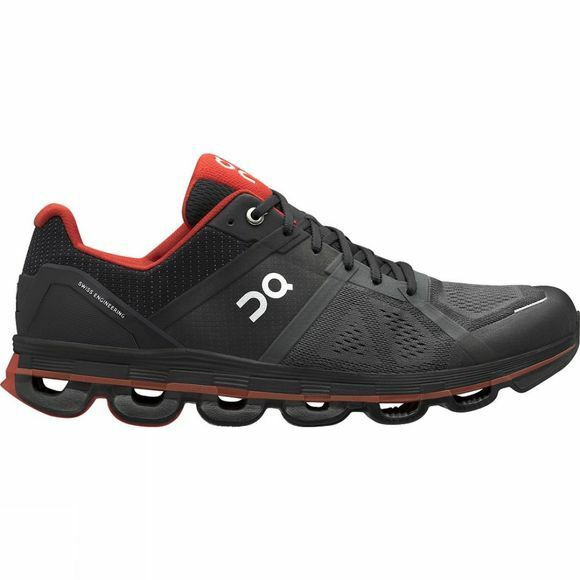 Described as the ultimate stability shoe, the Cloudace offers the best in comfort, protection and speed. Zero-Gravity Heel Clouds uses the most advanced application of the Cloudtec technology gives you powerful push-off and soft landings, giving you the smoothest ride. This coupled with a liquid injected speedboard, external TPU molded heel and premium upper lets you run faster, lighter and more comfortably than ever before. Upper: No-sew tape ensures midfoot stability while evenly distrubuting pressure throughout the foot. Speedboard: Extra-wide Speedboard stablizes the foot throughout each phase of the run motion while also propelling push-off. Sockliner: Ultra light dual-density sockliner made from high-resilient compression EVA and adaptive memory foam. Outsole: Ultrasoft landing zone.Midfoot supported by a natural transition zone designed to evenly distribute pressure.Trademark propulsion zone delivers a res-ponsive push off.